The kora is a harp lute: I've written this before, since kora music from the Mande cultural world is by no means uncommon. The kora itself is made from a large hide-covered calabash with 21-strings stretched along a long neck. The strings are divided into two rows, and pass across a high bridge mounted on the hide. The player grasps sticks protruding from the calabash to either side, and plucks strings with thumbs and forefingers. 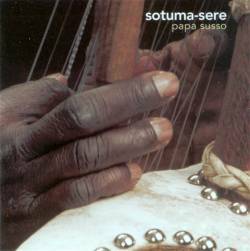 The recordings here are of Papa Susso from the village of Sotuma-Sere near the government city of Basse in The Gambia. The seven songs offered (total 63 minutes duration) are claimed to be representative of the core repertoire; they are based on traditional melodies and traditional styles of recitation. Susso has formerly resisted recording this repertory, preferring, because he believes that the songs, as allegories, are best told live, to present them in concerts. These, though, are studio recordings, recorded in the United States at Big Fat Suite. A good full sound is maintained throughout, with none of the background noise or the voice/instrument balance problems of many live recordings. There is also little hint of European or American influence, and no bite-sized shortening or elements of fusion encountered on many of the kora recordings made, for example, for Hannibal and sundry French labels. The album is distinguished by having extensive, informative, but readable notes by the ethnomusicologist Roderick Knight. Knight first recorded Papa Susso's autobiography in 1970, when Susso was just beginning his career. Susso was born into a jali family, a family of musicians and oral historians often known as griots who had passed down their family vocation over many centuries, reputedly from the 13th-century Mali Empire. In the past, his family had performed at the local court in Basse, and Susso was taught the kora by his paternal uncle, Karamo Susso, juggling his apprenticeship with the need to work in the fields. He left home for Sierra Leone, where he played for Gambian migrants. He traded cloth, moving to Liberia (where he took a degree in accounting at Cuttington University in Suakoko) then to the Congo. Back in The Gambia, he worked for the government, but by the end of the 1970s he had returned to making his living as a jali. Susso has, though, been living in America and touring internationally since 1988, returning to The Gambia most summers; he is, then, most celebrated as the kora soloist in Hannibal Lokumbe's orchestral and choral African Portraits, recorded with the Chicago Symphony Orchestra in 1990. Knight, incidentally, has been one of Susso's long-term students in America. The notes are at their best when explaining the structure of songs. Jaliyaa, for example, opens the CD, with a reference to Susso's Islamic faith in the opening line: "Yes, jaliya, it was Allah who created the tradition of jaliya". Although the song celebrates the hereditary institution of musicianship, the song was once used to promote Gambian unity, so here Susso extends it with lyrics composed for the first president of post-independent Guinea, Sekou Touré. To these, he adds recitation, sataro, sung in a rapid, descending line. Jaliyaa lasts more than 10 minutes. The second song, Sunjata, celebrates Sunjata Keita, the leader who unified the Mande people back in the 13th century. The long third song, Kaira, at almost 13 minutes, is a mid-20th century composition by Teneng Sory Kouyaté, a Guinean jali that adapts an earlier song for a nephew of Sunjata. Kaira means happiness or peace, and in addition to recitations and greetings to Allah, the text repeats a sung apology to the former president of The Gambia, Sir Dawda Jawara, by a jali who is reputed to have offended him, and also includes texts that urge the rulers to have sympathy for the poor. It is no understatement to suggest that it is the explanations of texts that make this album invaluable. Somehow, world music cannot get the kora out of its system: the boxes of record stores are awash with similar albums. The mix of instrumental, based around the ability of the player to use his two courses of strings to produce ostinato patterns that contain both melodic outlines and harmonic bass lines, with striking vocal lines, seems irresistible to many. While this album cannot, then, be considered to plug any gap in the market, the careful and extensive documentation does usefully allow listeners to understand what is going on, to appreciate the mix of fixed texts and subtle recitation, and to discover how musical allegories refer to leaders, musicians and other colourful people in the Mande world.